Earlier in his career, while climbing the coaching ladder, he spent eight years on the Northern Illinois staff, serving in two different positions during that time. Shafer remained in Dekalb, Illinois until it was time to reach the next rung, moving up to Illinois in 2004. That step proved to be a false one, and after one season, Shafer was cast adrift professionally once more, eventually serving at three different posts in the next four seasons. 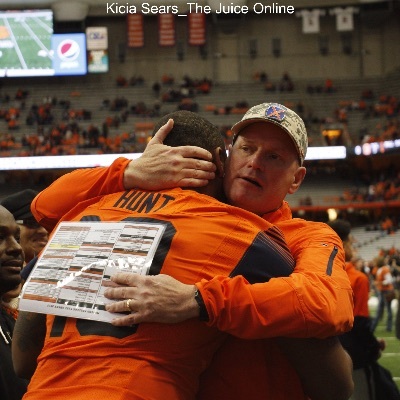 But, as the calendar turned to 2009, Shafer landed in Syracuse, filling the defensive coordinator vacancy under the freshly-hired Doug Marrone. And the northeastern Ohio native found a home five hours away, guiding an aggressive defense that helped resuscitate a football program on life support when he arrived. With the poor timing of Marrone’s departure to the NFL coming well after the 2012 season came to a close, the Orange opted for a move of continuity and promoted Shafer, giving him his first chance to steer his own program. 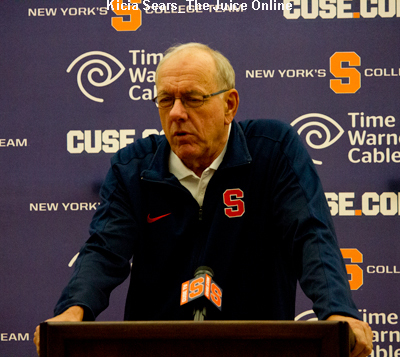 That was all taken away last Monday when it was announced that he would be fired at the conclusion of the season, ending his seven years in the Syracuse community. The days leading to the final game against Boston College gave Shafer the rare opportunity to “attend his own funeral”. 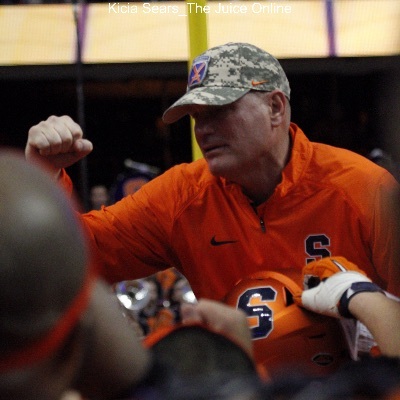 Testaments were made throughout the week to Shafer’s character as a person and were extended to many facets of the SU football program during his tenure as head coach. When Syracuse’s game-winning field goal kick split the uprights, the Carrier Dome crowd roared and the SU players sprinted onto the field in celebration. Following a postgame conversation with Eagle head coach Steve Addazio, Shafer was hoisted onto the shoulders of his players and carried to the end zone where the team stood for the playing of the Syracuse alma mater. Fans at that end of the stadium turned the familiar “Let’s go, Orange!” chant to “Thank you, Shafer!” during his ride. When the marching band finished, Shafer’s players surrounded him, each one wanting to give him a congratulatory hug in his final game. The team and staff moved to the locker room, where there would be one final speech. After those last emotional moments with his staff and players, Shafer left that locker room for his last press conference. All that was left was the dying.